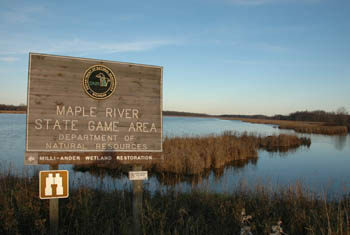 The Maple River State Game Area is mid-Michigan’s largest contiguous wetland complex, an extensive area of floodplains, lowlands, and marshes along the Maple River that begins in Gratiot County and spills into Clinton County. The 9,000-acre game area is divided into two sections with the West Unit containing most of the acreage but no established trails other than short access trails for handicapped hunters. Hiking opportunities are available in the East Unit, however. Straddling US-27, the East Unit features pools and diked-in ponds that serve as the water basin for the Maple River and attract migrating birds. Hiking along dikes is easy and the spectacular congregations of birds among the cattails in the warm glows of a late afternoon sun makes this trail system scenic and interesting for families and anybody who enjoys birding. There are more than 5 miles of trails in the state game area but the dikes in Unit A and Unit B are the most popular for hiking and birding. 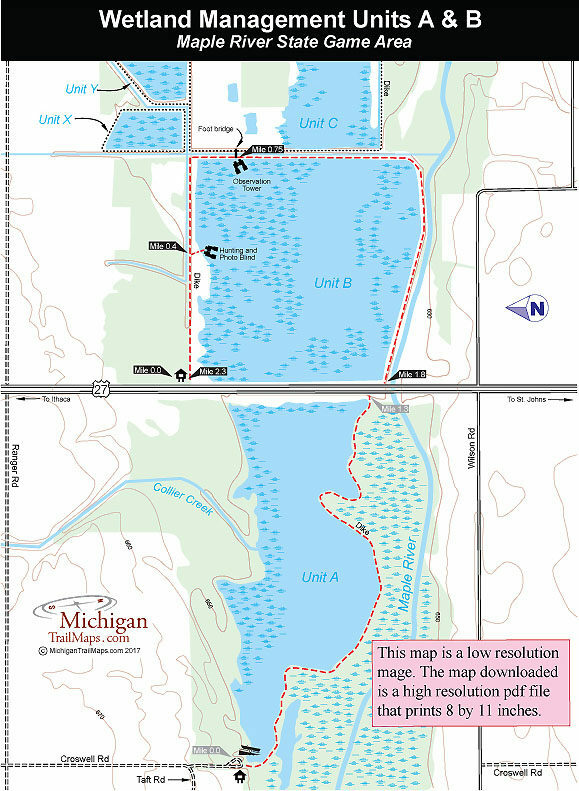 Unit A is a round-trip trek of 2.6 miles that begins at a boat launch located at Croswell and Taft Roads west of US-27. Unit B is a 2.3-mile loop on the east side of US-27 that includes passing a photo blind and an observation tower. 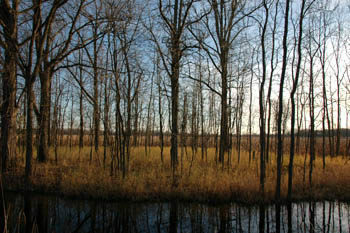 Wildlife can be viewed practically year-round in the game area. Spring viewing from March through May is excellent as thousands of ducks, geese, and swans use the wetlands as a stopover on their migration to northern breeding grounds. Throughout the summer herons are a common sight in the area while the observant or those who pack along binoculars might spot bald eagles or ospreys perched on dead snags. At the parking lot, the dike is a roadbed of pea gravel that begins by tiptoeing between the vast open marsh to the left and a smaller pond on the right, a beautiful start to any hike. Depending on what time of the year you arrive, a cornucopia of wildlife can be encountered. Unit A is particularly good for spotting wading birds and their broods while non-bird wildlife might include turtles, muskrats and beavers. Within a quarter mile the trail becomes a grassy two-track and in 0.4 mile swings in a more easterly direction. At Mile 1.3 the dike arrives at the embankment of US-27, where it's necessary to backtrack to return to the parking lot. The trailhead for the Unit B is reached just after you cross the Maple River floodplain and comes up quickly. Use caution in slowing down as US-27 can be a busy highway at times. From the small parking lot a gate marks the dike that head due east straight as an arrow. At one time this portion of the dike was a two-track of crushed slag but gradually most of the gravel is being hidden by grass. 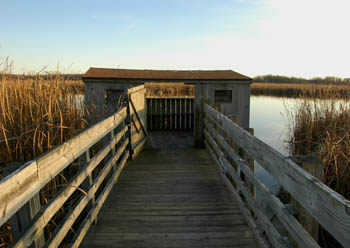 Within 0.4 mile you reach a long boardwalk that extends into the cattails. At the other end is a barrier-free blind, a three-sided shelter that keeps hunters comfortable during the fall and camera lens dry the rest of the year. There is open water south of the blind, providing hikers the opportunity to quietly watch great blue herons, bitterns or other birds fishing. The dike continues east with the cattail marsh to the right and a lowlying woods to the left. Eventually you swing south and at 0.75 arrive at the observation tower. The wooden structure raises 20 feet above the marsh to provide a different vantage point than the blind of the winged wildlife. Also at the tower is a bridge that leads to Unit C and a dike on the opposite side of the canal. It’s possible to hike around Unit C and end up back at this bridge with the additional loop turning your outing into a 4-mile trek. The Unit B dike continues south and then swings sharply west where you find yourself hiking a causeway between the extensive marsh and Maple River. At Mile 1.8 you arrive at US-27. It’s a half mile along US-27 back to the trailhead and your vehicle. The highway has a very wide shoulder and can actually be scenic as it cuts through the heart of the floodplain. But caution must used as US-27 can be busy at times. Other than small parking lots, display signs and an unimproved boat launch, there are no facilities at the trailheads. There are no entry or vehicle fees for hiking the starte game area. Both units are open to hunting and bright colors or even blaze orange should be worn during the fall, especially during the October duck season. From St. John's, head north on US-27 for 8.5 miles. The Unit B trailhead is a gated two-track and parking lot on the north side of the state game area, reached just after the highway crosses the floodplains. The Unit A trailhead on the west side is reached by continuing north and then turning west (left) on Ranger Road. Within a mile turn south (left) on Croswell Road to its intersection with Taft Road. Avoid Taft and continue south the dirt access road to the boat launch and parking area. The gate at the causeway marks the trail. Call the Rose Lake Research Center at (517) 641-4903. For lodging or additional travel information contact the West Michigan Travel Association (616-245-2217; www.WMTA.org).